Carrabba’s offers flavorful, handmade Italian dishes prepared to order in a lively display kitchen. Specialties include a variety of fresh fish, seafood and meats. Buy Carrabba’s gift cards at a discount to save on a fine dining experience for the whole family. Carrabba’s gift cards are an ideal gift for newly wed couples and those who like to dine out. Shopping Tips: Carrabba’s gift cards do not expire and have no hidden fees. 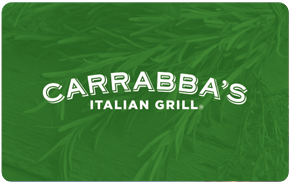 Below is a listing of our favorite places to buy Carrabba’s gift cards. There are always great deals and discount available when buying these so check back often. We will keep this list updated to reflect the best rates when possible. Carrabba’s Italian Grill is a casual restaurant chain specializing in Italian food in over 200 locations nationwide. Your favorite dishes are cooked to order in an exhibition kitchen. The food is always fresh – fish and chicken products are never frozen, and only fresh herbs are used. Private dining is available for meetings and special occasions and select locations offer online ordering. Read more on Gift Cards Discount Rates.